Use these creative morning-after pizza recipes and ideas to jazz up your cold leftover pizza. 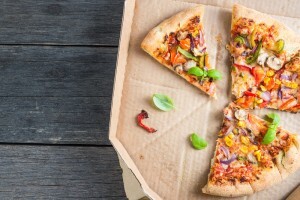 While there’s nothing as good as last night’s pizza the day after, gone are your days of eating cold leftover pizza in your pajamas, leaning against your open refrigerator. Keep the pajamas on, but get creative and take your pie to the next level with these easy hacks. Crispy, gooey waffle iron pizza is so delicious you will be tempted to order pizza just to let it go cold for waffling. Grab a slice of cold pizza and add your favorite toppings. Lay another slice of pizza on top and cut off the crust and tip. Place your squared-off pizza on a preheated waffle iron and cook until the cheese is gooey and the crust is crisp – about four to five minutes. Serve with a dipping sauce to fill those nooks and crannies. If one slice is good, pizza layers is better. Preheat your oven to 350 degrees. Spoon a layer of tomato sauce into the bottom of a 9×9 baking dish. Cut the crust off six slices of pizza and place on top of the sauce, with the pointy ends facing opposite directions. Cover with a layer of spinach, top with mozzarella, and spoon more sauce on top. Repeat with two more slices and top with mushrooms and ricotta for another layer. Finish with two slices of pizza face down. Cover with more tomato sauce and sprinkle with parmesan. Bake for 30 minutes covered with foil, then remove the foil and bake and another 10 minutes uncovered. If your salad is in a rut, perk it up with pizza croutons. Cut the crust off two slices of cheese pizza. Sandwich the two slices together with the cheese in the middle. Heat up your panini press and place the sandwiched pizza slices on the grill. Close the lid and press for up to five minutes, until the cheese has bonded the two slices together and the crust is crispy. Alternatively, if you are panini press-less, place the sandwiched slices in a heavy pan on medium-high heat and press with a spatula. Cut into small squares and toss into a salad or serve with hot tomato soup. If you aren’t in the mood to do much more than toss your pizza in the microwave, you can still pimp your pizza up with out-of-the-box ingredients. Give your Fremont Street pizza Las Vegas styling and add some sliced strawberries and drizzle with balsamic vinegar, or top with a mixture of corn, jalapenos and enchilada sauce for a South-of the Border style pizza. Any way you slice it, leftover pizza is even better the next day when you get creative.